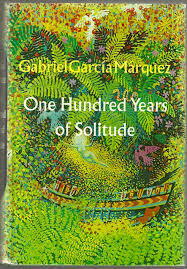 An essay on a One Hundred Years of Solitude summary looks into the novel that comments on the impact that international forces can have on what was once a sheltered, isolated insular community. Chronicling the experiences of the town of Macondo and its founders, the Buendia family, One Hundred Years of Solitude comments on the impact that international forces can have on what was once a sheltered, isolated insular community. While the author focuses only on the major events in the lives of the Buendia family, as he covers over a century in the novel, the reader can nevertheless see the parallels between the fate of the town and that of its founders. The original leader of the town, Jose Arcadio Buendia, is an enigmatic leader who is more content to turn inward than look outside the town’s borders; in fact, the only contact with the outside world experienced by the town of Macondo comes from the occasional gypsy that ventures into the area. Once the Buendia patriarch’s sons take over, the path of the town begins to change. Despite the women in the family having eccentricities, as well, the matriarch, Ursula Iguaran, does what she can to keep her family together. However, she cannot stop what is coming. A banana plantation moves in, and the corresponding American owners live in their own fenced-off section of town. When exploited workers go on strike, they are massacred by the army who is in league with the plantation owners. Following this demonstration of inhumanity, the town begins to suffer, first with five years of unending rain, and later with a flood that destroys nearly all the city. The Buendia family turns in on itself until just one member remains; the reader learns from this sole survivor that the town’s fate has been prophesied and that nothing anyone did could have stopped their travels down this doomed path. Gabriel Garcia Márquez - Essays on Gabriel Garcia Márquez discuss one of the greatest writers to come out of Colombia that won the Nobel Prize for Literature in 1982. Paper Masters writes custom essays on a One Hundred Years of Solitude summary and looks into the novel that comments on the impact that international forces can have on what was once a sheltered, isolated insular community.